If you haven't seen Can You Ever Forgive Me?, please do — both Melissa McCarthy and Richard E. Grant (not to mention Jane Curtin!) are brilliant in this true story about a woman who resorts to forgery when her sheer talent isn't enough to put food on the table. 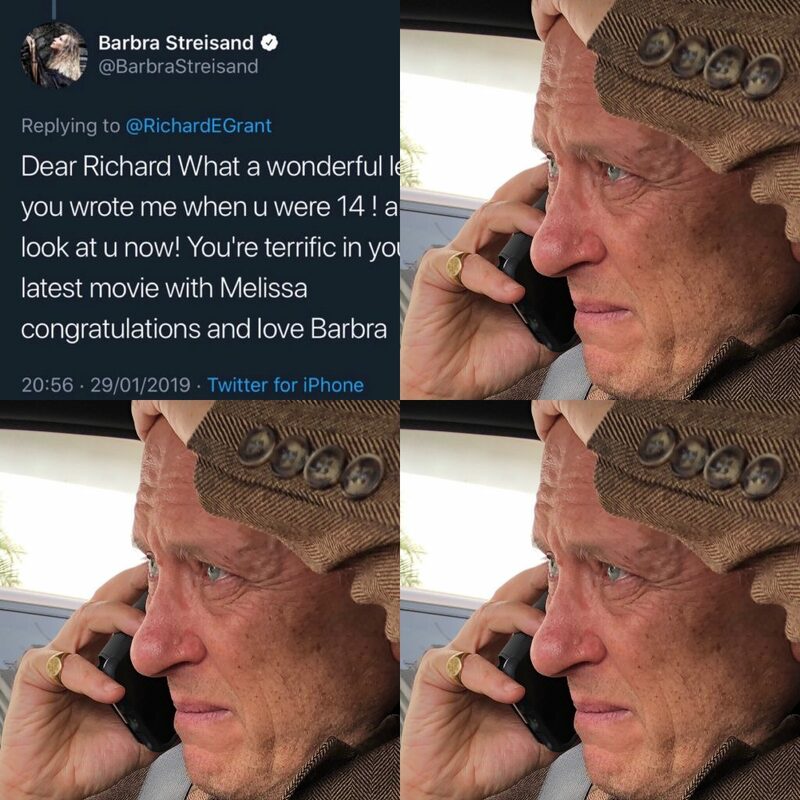 Both leads are Oscar-nominated, but it is Grant, 61, who is capturing headlines, first for his ecstatic reaction to the honor, and now for receiving an answer to his Barbra Streisand fan letter some 50 years after the fact! 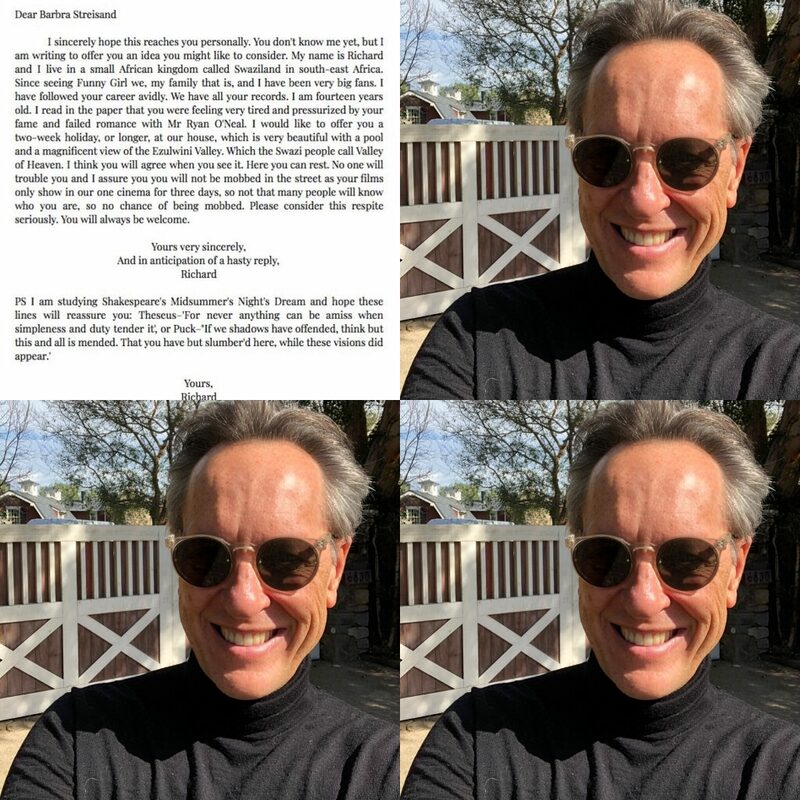 Grant giddily posed for a picture outside Streisand's home and posted the selfie along with his original fan letter to the diva, which sweetly invited her to take a vacay at his Swaziland home during a period when gossip rags were reporting she was "tired" after her romance with Ryan O'Neal broke up. I should think this makes Richard E. Grant the king of all fanboys! (And, as he admits, it definitely makes his wife most understanding). I sincerely hope this reaches you personally. You don't know me yet, but I am writing to offer you an idea you might like to consider. My name is Richard and I live in a small African kingdom called Swaziland in south-east Africa. Since seeing Funny Girl we, my family that is, and I have been very big fans. I have followed your career avidly. We have all your records. I am fourteen years old. I read in the paper that you were feeling very tired and pressurized by your fame and failed romance with Mr Ryan O'Neal. I would like to offer you a two-week holiday, or longer, at our house, which is very beautiful with a pool and a magnificent view of the Ezulwini Valley. Which the Swazi people call Valley of Heaven. I think you will agree when you see it. Here you can rest. No one will trouble you and I assure you you wll not be mobbed in the street as your films only show in our one cinema for three days, so not many people will know who you are, so no chance of being mobbed. Please consider this respite seriously. You will always be welcome.